The purpose of this blog is to share some cool internship opportunities, provide a place for students to ask internship questions, and make a space for past interns to share their experiences. We hope you take advantage of this website and that you become more familiar with internships! Ghana, Africa. A cultural, happy, crazy hot country full of fun, hardworking, God-fearing people. I had the perspective-altering experience of spending six weeks there helping local eye care clinics bolster their outreach programs. I think that the best way to describe what it was like is to share the following email which I wrote about four weeks into the trip. I have tried but I cannot even begin to organize the events, thoughts, feelings, and opportunities that make up these past couple of weeks. I wish I could record each moment and create a video to watch every day for the rest of my life. There's just not enough time to live and record life at the same time. 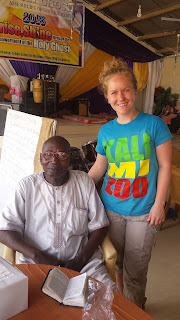 Recently we've been spending most of our time in villages in the Volta Region as well as the Eastern Region. When we were working an outreach on Tuesday there was a boy who was about twelve with Conjunctivitis so severe that as he waited in line he held his eyes in his hands-in a rag that he had used to collect the discharge. All he had was pink eye but because he didn't have the necessary medicine it was completely debilitating. After I tested his visual acuity I watched him wait in line and I wanted to wrap him in my arms and tell him that it will be alright! We have eye drops that will completely fix your problem in just a few days and will give you relief immediately. ...he just needed to wait a couple more hours to see the optometrist. It's amazing to me how patient the people are here. They can wait in line to see the optometrist for hours and hours without getting angry. Ha ha unless someone cuts them in line. Then there are straight-up fights that break out. Outreaches keep us pretty busy but we always seem to find time for fun adventures! There is so much to do in Ghana! On Wednesday we went to reggae night on Labadi Beach. Ha ha THAT was an adventure! 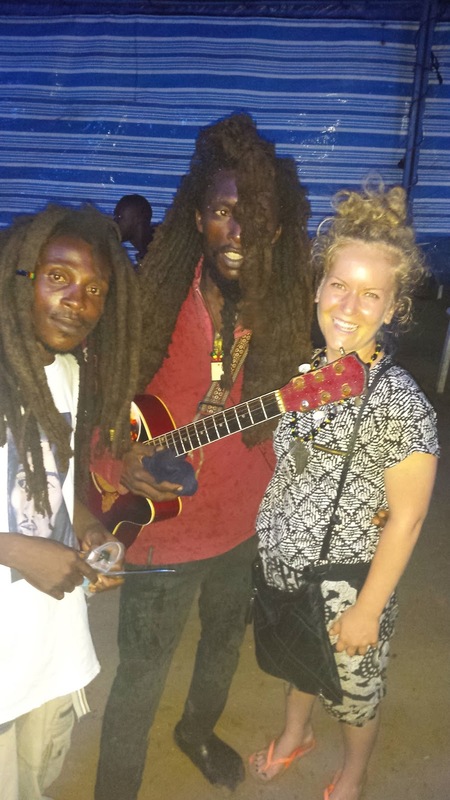 I made a few Rasta friends who were really respectful and funny and loved to talk. Ha ha they loved my hair and I got several offers from guys who wanted to turn it into dreds. If I weren't returning to a professional job I would totally get a weave but probably not dreds. 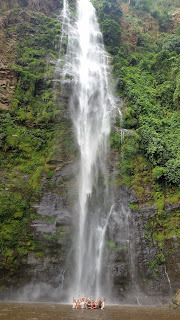 Yesterday we drove six hours northeast to swim under west Africa's largest waterfall! Wli falls. It was absolutely gorgeous! On our way back we stopped by a monkey sanctuary and held monkeys as they peeled their own bananas! Oh Africa... so cool! As an MMBio student I don’t feel like I was ever really encouraged to study abroad. I was too focused on doing well in my classes, doing research, working, preparing for grad school, volunteering, etc. However, I ended up having a free spring term before I started an internship in Idaho and I wanted an adventure. When I decided to go to Ghana for this Public Health internship I didn’t think that the experience would affect my future career goals to be a healthcare provider here in the States. But it did. Because of the people I got to know and the situations I saw them conquer, a part of my heart has softened in a permanent way. I want to be gentle. Kind. Understanding. I want to take care of people and help solve their problems for their sake. Out of love. I desire to help others be strong. Strong in mind, body, and spirit. 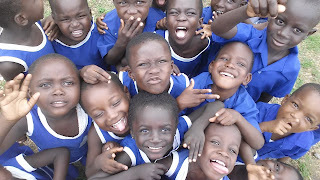 The people of Ghana taught me that happiness comes from balance and selflessness. I don’t believe I could have begun to learn those lessons in a better setting than among the most balanced, selfless people I have ever known. I would most definitely encourage all future physicians, nurses, dentists, lab techs, or anyone planning to take care of people to study abroad. Go to a place where you can make an immediate difference and be so abundantly appreciated. I would especially recommend having this experience in an impoverished place. I believe that to recognize how blessed we are in America is a wonderful way to gain humility and compassion for others. And the best healthcare providers that I have known are humble and compassionate. Don’t fret about the cost of studying abroad. If you persistently apply and ask, you will find that there is always money for you and the Lord makes miracles happen. The Kennedy Center website has a long list of scholarship foundations that search for students who want to travel abroad. I received a generous grant from the College of Life Sciences for travel costs and another scholarship from The Benjamin A. Gilman Foundation which together completely covered the cost of my trip to Ghana. If you feel like you can’t afford to study abroad, apply for the Gilman scholarship! Their goal is to help students financially who otherwise wouldn’t be able to travel. The amount they give you is based on your need and the cost of your trip. In summary, I encourage you to leave the country, gain a more global perspective, and allow the experiences that you have studying/interning/serving abroad to affect the type of professional you plan to be. It is so absolutely worth it. I had pinned almost everything I would be doing at the aquarium. I cleaned tanks, changed floss bags, filled tanks after backwashing, vacuuming out tanks, and I got to feed fish, reptiles, amphibians; I was even allowed to do a feed show. There were days that I really enjoyed being there and the work that I was doing. There were other days where I messed up so badly that I wanted to drive home and be done for the day. 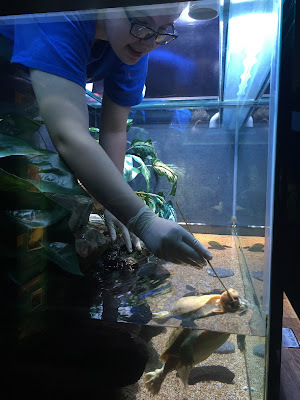 I learned a ton about the animals that I worked with, how aquariums look like behind the scenes, what all is involved in keeping one running and that being tall isn’t a pro when it comes to working in an aquarium. Most of all, I learned some things about myself that I didn’t know. Ever since I was a child, I knew I wanted to be a marine biologist and work with fish. Fish are super cool animals and I stand by my original sentiments about them. This summer was me putting my theory into practice. Yes, I loved feeding the animals, cleaning the tanks and waving at the children that would watch me, and getting the inside scoop. What I didn’t expect was how I feel about it after three weeks. As I have contemplated how I would enjoy this as a career, I came to realize that I wouldn’t be content cleaning the same 20-30 tanks almost weekly for the next 30 years of my life. The time at the aquarium wasn’t wasted, I have learned that I need a different career path and have two years to change my focus and try my hand at some other biology and chemistry related fields. I came away with some great memories and some great work experience with animals. Interning at Centro Hispano was a fantastic experience. I had a wide variety of opportunities to stretch myself and learn new things. My duties included social media manager, HIV lab technician, public health event organizer, and I even helped write and apply for federal grants. One of my original goals was, “To learn how to empathize with those who need help to improve their health, [and] also learn how to lead them to a better lifestyle.” I’m happy to report that I accomplished these goals. As part of my internship I completed training to become an HIV prevention counselor and lab technician. Through this training I became certified by the state to test and counsel at-risk/HIV positive individuals. Some of our grants focus on the LGBQT community, a demographic that I had little experience with. Through this internship I was able to interact on a personal and medical level with these people. I learned how to empathize and lead them to a better, healthier lifestyle. I remember a specific time, while performing a test, when I had to calm down a patient who had a phobia of needles; I did this by telling all the lame jokes I knew! Though we may share some differences, our similarities certainly outweigh them. No other experience, including my mission, had allowed me to interact with these people in this manner. At one point of my internship I was asked to run a booth at a statewide soccer tournament. Our booth, which focused on our anti-tobacco campaign, had a carnival game, which became very popular with the youth. Part of my task was to talk to and teach the children (and occasional adults) that were waiting to play the game. This experience taught me to get on the level of the children, and teach to their understanding. I also had to learn new Spanish words so I could interact with the adults. This experience was completely unique! As part of the social media campaign I created health related info graphics, updated the Centro Hispano website, and reached out to the Latino Community through the Instagram and Facebook pages. The purpose was to lead them to healthier lifestyles, and available resources like nutrition and exercise classes. Over time I learned what attracted attention and what did not. In the end my work reached thousands of Latinos in the Utah Valley community. This was a successful summer. I stayed very busy, and accomplished many things that will benefit me in my life and career. I’m thankful for the opportunities that presented themselves, and the lessons I learned. The last year of volunteering with CARMA has been an exceptional opportunity. I have met many amazing people, learned a couple great new skills, and expanded my knowledge of the medical research world immensely. The first six months were hard trying to accustom myself to CorView and to my team, complete my training, and try to figure out a good schedule to get up to Salt Lake but I enjoyed every moment and all the stress was worth it in the end. The last six months have been awesome, especially these last couple summer months that I’ve just been able to dedicate myself entirely to working with my team. I always knew that there is need for repetition in science to confirm a study, but I never realized how hard it is to work through all that repetition wondering if it is going to produce a result. Part of it is fun and exhilarating, but it’s mostly just stressful! The significance of this experience for me has been a big one. I feel like I have boosted my self-esteem when it comes to making a difference, being knowledgeable about something, and working on a team. Seeing something that I’m doing have a direct impact on the health of others is very rewarding and something I hope to do all my life. I also came to know some things about myself. I realized that, although I like many aspects research, I miss the face to face interactions that come with working in other areas of the medical field. I spent many hours alone in the office working on whatever project was at hand and I always felt a relief to get out and about afterwards. I think the biggest benefit that this internship has had for me is that it has helped me realize that I can do great things. I can be a part of an idea that makes a difference for others. I can think of new ways to improve healthcare. I can work in an important team. I wouldn’t trade this experience, if feel like it has really shaped my life in a very wonderful way. BYU provided me an amazing opportunity to spend the summer interning with the Utah Department of Child and Family Services. I specifically got to work with the permanency team in Spanish Fork. . The permanency team is responsible for helping children in the community to be a part of safe, stable families. My daily activities have included making visits to the homes of families currently receiving services from the state to make sure the children are safe, documenting services being provided to clients, holding multi-disciplinary team meetings, attending court, accessing community resources, and much more. During this internship I realized the importance of having good foster care families in the community. I also learned about the court system and the importance of good legal representation. However, the most important things I learned about were self-care and working in a team. Social work is an especially taxing profession because you give so much of yourself, your emotions, your heart, and your mental energy. It takes all of your internal resources to be able to help families heal. It was great getting to be a part of that process, but on days off, I had to learn to truly be off. I would leave my phone on silent, and not check emails or texts for the day. Then I would go hiking or spend time talking to friends. Taking the time to recharge and refuel allowed me to maintain enthusiasm for my work. Enthusiasm and positivity are important attributes because they foster sociability. Social work is inherently social and a lot of the work I did on my internship involved getting to know many different types of people from all different professions. I got the opportunity not only to work with social workers, but also with lawyers, judges, foster parents, biological parents, kids, teens, therapists, police officers, doctors, nurses, IT personnel, and secretaries. All of these people have different strengths and as a social worker I got to help orchestrate their efforts to capitalize on those strengths. It takes a lot of work, but it’s also a lot of fun! I would recommend an internship to anyone, as it has given me invaluable experience as well as excellent networking opportunities. This is the second internship that I have done through the BYU Internship office; both have been great experiences and have taught me different things. The real world experience has helped make my professional choices clearer and put me at ease that my career will be a good fit. Recently I was at a family gathering, and I was telling some of my cousins about all of the amazing experiences I’ve had while job shadowing a pharmacist in the Emergency Department at UVRMC. One of my cousins made a comment about how it was hard for her to believe that the girl sitting in front of her was the same girl who had passed out when she got her ears pierced. Looking back at who I was then and who I am now, I can easily see that she’s right. When I started job shadowing in the ED, I was sixteen. Despite almost being through my Associates degree, I didn’t know which educational path I was going to pursue. I didn’t know where I was going to be in a year—which college, which major—let alone what job I was going to be doing in ten years. I was terrified of the future and everything that it held. I was mortified to make decisions about my future because I knew it would make me feel tied down and stuck in one career. I was scared I was going to have to settle into a profession or field that I hated. Now, I know exactly what I want. I know who I am and where I’m going. Instead of looming uncertainty about my future, I see endless possibilities in a field I’ve fallen completely in love with. I know where I’ll be in a year, and while I don’t know exactly what job I’ll be working at in ten years, I know it’ll be one I love and am well trained to do. It would be a lie if I said all the changes I’ve experienced are because I job shadowed. But a lot of them are because of the time I’ve spent in the Emergency Department. The ED was always something that I didn’t think I could do, and I definitely didn’t think I would like it, but since day one, I set out to prove to myself that I could thrive there, and I did. And pretty soon, existing in the ED wasn’t hard anymore—it was fun. I’ve honestly never felt such a sense of belonging, outside the walls of my home, than I felt at the hospital. People there know and respect me. The ED staff would go out of their way to include me and make sure I had every learning experience possible. While I was there, I felt like a future medical professional, instead of a teenage girl who didn’t really know her place in the world. Beyond that, I truly learned who I am as a person. I learned that I occasionally get queasy and dizzy in stressful situations. I learned that blood doesn’t bother me as much as the atmosphere in the room when a patient is fighting for their life. I learned that I don’t give up, and I fight for what I want, even if it’s hard or embarrassing or out of my comfort zone. I learned that I’m strong and smart and ready to enter the world as a professional. This internship was a great opportunity for me to jump right into the medical field. From day one, I was able to do meaningful work towards helping the medical/surgical floor improve the quality of its care. Early on in the internship my floor manager communicated to me the goals that she had developed for her respective area. She specifically wanted to work on improving the staff’s responsiveness. I was able to work with her and the charge nurses to create a plan that would help us accomplish this goal. Rounding (going on rounds) with the nurses not only gave me an opportunity to validate them on their 8 behaviors of hourly rounding, but it also gave me an opportunity to view what a career as a nurse would look like. Previously I had never known how busy nurses are with all the patients that they attend. The ability of the nursing staff to listen and show compassion to each patient was extremely admirable given how busy they were. My duties when rounding on patients were more of a quality control nature. In order to make the most of each round, I focused the questions that I would ask the patients on the goal we had set as a floor. The questions were oriented to help me understand how frequently the patient felt the nursing staff was visiting them and how quickly they felt the nurses would respond to their call button. The information given by the patients provided me with an opportunity to immediately address concerns either with the patient or with their nurse. It also provided opportunities for me to validate and give positive feedback to the nursing staff, as many of the patients were extremely pleased with the care provided to them. Perhaps the most rewarding part of this internship has been the relationships that I have been able to build with both the nursing staff and the patients. Among the nursing staff there is a feeling of comradery and family; it was an amazing experience to be apart of this. The nursing staff was always appreciative of my work and always took into consideration the feedback I gave. The positive environment among staff members contributed to the great healthcare provided on the Medical/Surgical floor. This internship was a valuable experience for me. It helped to understand the importance of responsive nurses. It also helped in my ability to see how crucial it is for all members of the hospital staff to work together in order to provide the best care possible. It was an amazing opportunity to participate in providing good health care for patients. During Winter Semester 2015, I realized how important it was I start taking the initiative to figure out what I wanted to do with my life. The countless options were daunting and all I knew was that I had to start somewhere. I had the fortune of talking to the right person at the right time. One day, I noticed a fellow student wearing a suit. I asked him what he was wearing the suit for and he ended up sharing with me an e-mail address I later used to get myself involved in the Patient Experience Internship at Utah Valley Regional Medical Center. I took the internship as a way to help me accomplish two goals; to help me find out if I wanted to pursue a career in healthcare, and help me develop the communication skills I would need in any future career. The Patient Experience Internship was unlike anything I had expected. I found it to be an amazing networking opportunity. I met several administrators and managers from the hospital and I even got to work alongside them in several service projects. I learned to incorporate the hospitals motto into my life, “Helping people live the healthiest lives possible.” Our internship itself also had another motto, “Be always.” The internship was geared at helping us become the best employee possible at all times; to teach us what grit, hard work, and ingenuity were. Our main goal was to improve the experience each patient had in the hospital, and it was solely our responsibility to form relationships with the patients, the nurses, and their managers to make sure changes were made to improve the hospital’s overall rating. The environment that exists in Intermountain Healthcare is unique. Walking into the hospital quickly became my favorite part of the day. The employees are trained to smile and greet you. I got to have meaningful conversations with many of them. I even had lunch with several employees. The nurse manager taught me a lot about how to reward employees and how to run an office with love and respect. I admired the things he taught me and the insight he had on healthcare. With his help, and the help of the other interns, I learned to communicate with patients during their darkest hour to help them feel less anxiety. With the patients, I incorporated the things I learned from the nurse manager and I had even more meaningful conversations. I ended up putting a lot more time than I had previously anticipated into this internship. If I could go back, I would probably sign up for another credit. I left the internship being reassured that healthcare is the most rewarding career I could pick and I would not rather be doing anything else. Being able to leave each day knowing I made a difference is something I definitely want to have in my career. Over time, it was interesting to see how much easier it was to communicate with patients and nurses at times when communicating may have been difficult or even painful. I am excited to apply what I learn into my future jobs and Internships and I hope I now have the tools I need to really make a difference in the lives of many people. Alk-Abelló is a Danish based pharmaceutical country that has a heavy focus on research and innovation in the field of allergy immunotherapy. I worked in their source materials facility and was primarily involved in the collection of various pollens used in product and in research. This year, ALK had their revolutionary new allergy immunotherapy approved for use in the US. Their design delivers the doses in a dissolvable tablet form instead of the more traditional approach of allergy shots. What this means is that during my time at ALK, I had the unique opportunity to see how a primarily research based company transitions into a production based company. Through this unique experience I gained invaluable insight into how the life sciences work in the professional word. In addition, I had some great hands on experience with practices in my field of study. It was especially interesting to spend some time in the quality assurance (QA) lab where I could see many of the tests that I studied in molecular biology being used on a daily basis. I had the opportunity to pour my own gels, test unknowns for water content, and check product uniformity through a microscope. I also got to see tests to verify protein content in samples brought to the lab. Though I did not spend a lot of time in the lab, I am grateful that I was able to get a little exposure to how a lab is run at a company and how it differs from an academic facility. The biggest initial difference was just the cleanliness. It is clear that as a company, consistency is exceptionally important to make sure the product is the same each time. It is easy to see how things like lab cleanliness contribute to making a consistent product. I was especially glad to have the opportunity to work on a pollination history project. It was an excellent opportunity to learn valuable excel skills as well as gain an appreciation for the importance of good record keeping. I gained an appreciation for the very explicit documents describing procedure. Maintaining consistency and quality struck me as some of the biggest hurdles to overcome working with a biological product. In addition to this experience, I also had the opportunity to work on experiments designed to test the best ways to extract pollen from two different grass species. We subjected the cut grasses to varying water amounts, temperatures, supplements, etc. to learn how to maximize the output of high quality pollen. We also tried leaving the pollen in the collection sheds for longer in order to see how long the would drop useful amounts of pollen. I was especially glad to have the opportunity to work on the pollination history project. It was an excellent opportunity to learn valuable excel skills as well as gain an appreciation for the importance of good record keeping. I gained an appreciation for the very explicit documents describing procedure. Maintaining consistency and quality struck me as some of the biggest hurdles to overcome working with a biological product. In addition to this experience, I also had the opportunity to work on experiments designed to test the best ways to extract pollen from two different grass species. We subjected the cut grasses to varying water amounts, temperatures, supplements, etc. to learn how to maximize the output of high quality pollen. We also tried leaving the pollen in the collection sheds for longer in order to see how long the would drop useful amounts of pollen. Ultimately, I am very grateful for the opportunity that I had to be a part of the ALK team this summer. The things that I learned are things that will help me to continue to grow, both in an academic and professional experience. It was an excellent opportunity to start a network of people who work in the field I am interested in working in, as well as get some hands on experience both in a professional lab and in raw materials collection from the field.